Latino voters and Democratic lawmakers remain opposed to two controversial bills to reform Arizona’s early voting system despite efforts to add bipartisan amendments to each measure. Arizona’s rate of rejected ballots and high numbers of provisional and early voting and absentee ballots submitted has landed the state in the bottom third of all U.S. states for election performance in previous elections. An immigration activist who's one of the leaders of the Dream Act movement is joining the staff of U.S. Rep. Kyrsten Sinema as a district outreach director. The state Supreme Court says parts of a proposal to transform Arizona's primary election system fit together as one proposal and didn't have to be kept off the November ballot. 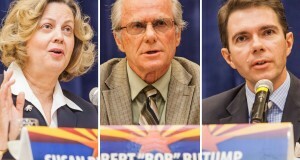 The end of matching funds precipitated record low participation in Arizona’s Clean Elections system this year, and the candidates who switched away from publicly funded campaigns fared well. While Joe Arpaio’s political dominance carried him to a sixth term as Maricopa County sheriff, his 2012 re-election reveals a geographically divided electorate and dwindling support among Republican-leaning suburbanites. Arizona Secretary of State Ken Bennett has accepted an invitation to testify before the U.S. Senate Judiciary Committee on Wednesday in Washington D.C. In the days following the election, the Maricopa County Elections Department endured harassment, vandalism and a possible cyber attack – all while the office was trying to count a record number of votes left over from Election Day. Two well-funded ballot initiatives went down in defeat last month, but as their final finance reports showed, their campaign coffers had perhaps foreshadowed the elections’ outcome.